LFA For(u)m connects Arizona developers to our large and growing network of locally-owned businesses to enhance connection to place in infill and adaptive reuse projects across the Valley. Below are some of our developer members' current projects. Vintage Partners reinvents an iconic shopping center, built by Del Webb in 1955, and extensively rehabilitated in 2016. Anchored by local upscale grocer AJ's Fine Foods, and joined by Local First members including Local Nomad and Huss Brewing, restaurant, retail, and health tenants would join a vibrant cross-section of local businesses. Seven spaces remain at 2-52 E Camelback Rd, at 1,400-6,694 sq. ft. in size. All spaces available immediately, just across the street from the Central & Camelback light rail station and within blocks of Stinkweeds, Frances, St. Francis, Practical Art, and the numerous concepts of Upward Projects. Project details here. Developer details here. 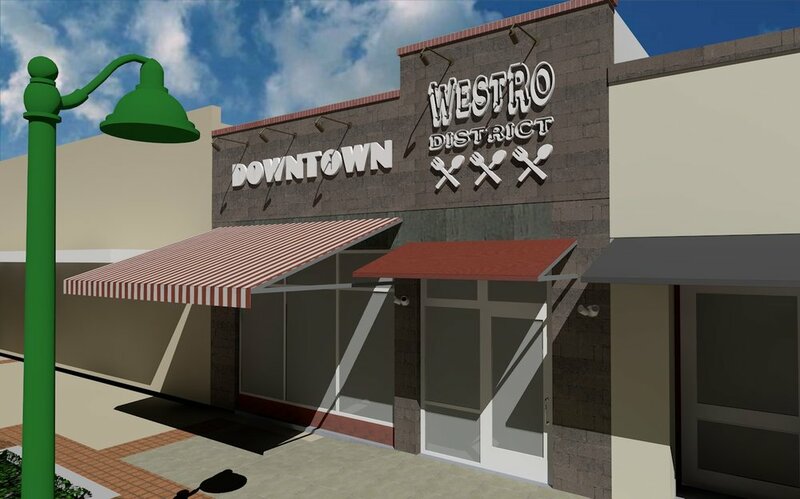 Starmar Investments offers two remaining storefronts along Main Street in downtown Mesa, contributing to the ever-growing retail and hospitality opportunities in the corridor. One of the remaining properties, at 212 W Main St, is slated to be a recipient of a recent Mesa facade improvement grant, funding the design and construction of "new" storefronts, removing the colonnades and reclaiming the historic entry, spanning 2.6K sq. ft. A second property sits across the street at 215 W Main St, currently at 2K sq. ft, with the potential to double in size. All are immediately available through Phoenix Commercial Advisors. Wetta Ventures offers one space, 2.5K sq. ft, of purpose-built restaurant space, with ample patio space amidst massive SkySong mixed-use development in south Scottsdale. This unique development includes access to 3K square-feet of edible garden space, curated and maintained by local gardener Agriscaping. Dedicated parking onsite, and part of multi-phase in-progress development including ASU SkySong tech hub/incubator, 1.2M SF office development, apartments, and hotel space. Includes year-round catering opportunities as "preferred vendor" for plaza. Project details here. Developer information here. One of the City of Phoenix's "Midcentury Marvels," Wetta Ventures has lovingly preserved the former Paul Johnson Jewelers across the street from the historic Town & Country shopping center, and blocks from the marquee Biltmore Fashion Park. View Listings for retail, restaurant, office, and more. Browse by broker, or location.